The subject of Ancient Egyptian Curses never cease to fascinate us. The mysterious circumstances and deaths which surrounded the excavation of the tomb of Tutankhamun led to a media frenzy on the subject of the 'Curse of King Tut' and the 'Curse of the Pharaohs'. What were the Ancient Egyptian tomb curses? Are they fact or fiction? There were several curses associated with Ancient Egypt which included the Curse of the Pharaohs, the Curse of King Tut, the Curse of the Pharaoh Khety and the Curse of Hermeru. Tomb Curses were invoked for any acts of violation and threatened any violators with judgment in this life and in the underworld. The idea of a 'Curse of the Pharaohs' was born following the death of Lord Carnarvon after the tomb of King Tut was excavated. The Curse of the Pharaohs idea was fuelled by a novelist named Marie Corelli. This so-called 'Curse of the Pharaohs' was in fact based on an Arabic text. And it was not inscribed on the tomb of King Tut. Sir Arthur Conan Doyle, the creator of Sherlock Holmes, then joined in the 'curse frenzy' by announcing that Lord Carnarvon's death had been the result of a "Pharaoh's curse". Following the discovery of the tomb of Tutankhamun Lord Carnarvon signed a £5,000 contract with the London Times, plus 75% of all profits from the sale of Times articles to the rest of the world. A newspaper reporter called Arthur Weigall from The Daily Mail was furious about this monopoly on the news of the tomb of Tutankhamun. Arthur Weigall and other reporters were forced to find different angles to cover the story in addition to the Times stories that were fed to newspapers. Arthur Weigall then added more fuel to the speculation about the Curse of King Tut. 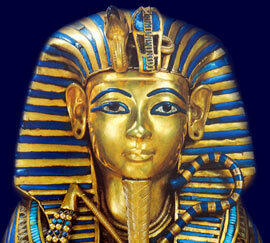 The curse of King Tut is reported as "Death comes on wings to he who enters the tomb of a pharaoh". This derives from a section of chapter 151 of the Book of the Dead. Four 'magic' bricks were found in the tomb of King Tutankhamun and each brick was inscribed with a spell from chapter 151 of the Book of the Dead. "He shall be cooked together with the condemned"
"He shall have no heir"
"As for anybody who shall enter this tomb in his impurity: I shall wring his neck as a bird"
"He shall be miserable and persecuted"
"His name shall not exist in the land of Egypt"
"He shall die from hunger and thirst"
There were some Ancient Egyptian curses. These were written on tomb walls in hieroglyphics or spoken by priests as part of a death ritual. The tomb curses related to the punishments in the afterlife which would be enacted by the gods and the ghosts of the occupants of the tombs. The tomb curses were designed to frighten anyone disturbing the tomb, particularly the tomb robbers. But tombs were not just protected by curses. Robbing an Ancient Egyptian tomb was dangerous work. Each section of the Tomb Curses addresses all topics and provides interesting facts and information about the Golden Age of Pharaohs and of Egypt. The Sitemap provides full details of all of the information and facts provided about the fascinating subject of the Pharaoh - Tutankhamun and the Tomb Curses!